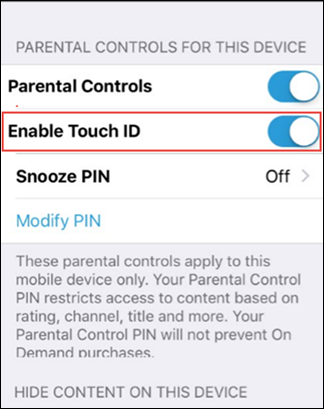 The Contour app allows you to use your Touch ID when changing the Parental Control settings. The Touch ID method that allows Apple iOS users a convenient alternative to the Parental Control PIN. This process requires you to configure your Apple device for Touch ID, refer to Apple Support. 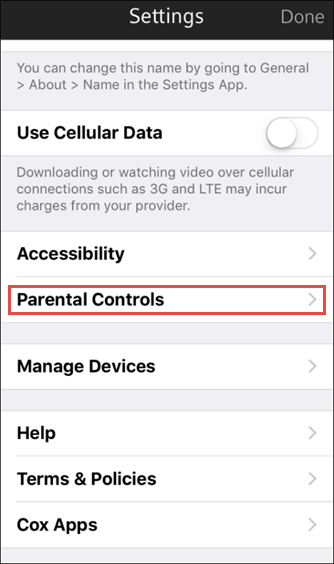 The Contour App continues to prompt you for your Parental Control PIN if you tap Enable Touch ID without setting up a fingerprint in your Apple device. The Touch ID isn't avaible for this device if the Touch ID option is dimmed. For compatiblity restrictions refer to Apple Support. Swipe left to right from the Main Menu. Tap the Settings gear, located at the bottom of the menu. 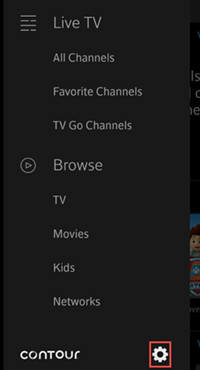 In the Settings menu, tap Parental Controls. Result: Touch ID is now active and can be used to change Parental Controls instead of entering the Parental Control PIN.